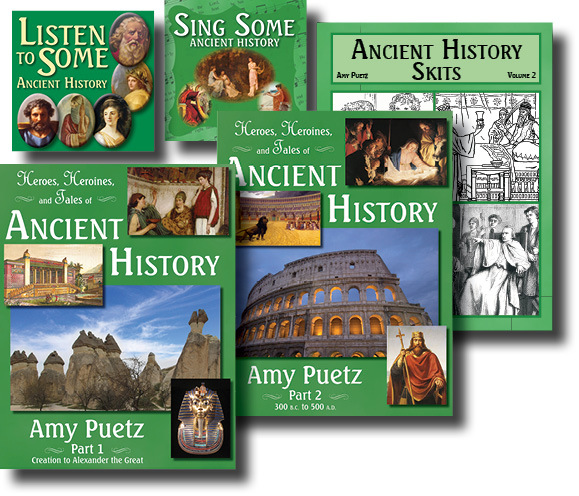 We recently had the opportunity to review new history curriculum from Amy Puetz entitled "Heroes, Heroines, and Tales of Ancient History." Two years ago, the kids and I used her American History curriculum and loved it so I was very happy to hear that she'd created one for Ancient History - especially since that's the time period we've been working on this past year! Here's our take on the curriculum. This curriculum teaches information about ancient history but also tells stories of historical people from the time periods. It also incorporates more than just history - there are maps and geography, writing assignments, crafts, music, and more. The activities are really what help bring this curriculum to life. They include so many great things that really help the kids to remember and get interested in what they're learning about. Some of the activities: cooking recipes, playing games and listening to songs, making crafts, or doing an experiment - and they're all based on the time period you're studying. You can pick and choose which activities work for your family. There are 30 weeks worth of lessons - it has a beginners section for younger kids in first and second, and an advanced section for older kids in grades third through sixth. (Works great since I have an older and a younger - and several other littles that listen in!) The curriculum package comes with Parts 1 & 2 - which each include 75 lessons; the Additional Materials CD with timelines, art, video, etc. ; Historical Skits, Sing Some Ancient History CD, and Listen to Some Ancient History Mp3 CD. Each lesson is about 30 - 60 minutes long, depending on what reading, music, and other activities you do. We love history so I go ahead and plan on devoting an hour to it. List of supplies are included (always helpful) as are additional resources and answer keys. The pronunciations on the Additional Materials CD is extremely helpful! You don't think of something like that until you come across it in a textbook and then you're stuck trying to decipher it for your kiddos. My oldest son loved reading the historical skits - I think these will be even more of a hit once we have more readers in our family that are able to participate. The kids love acting stuff out. There is a free shipping event going on right now but it also ends TODAY! (Sorry I didn't get the post up sooner, we've been slammed with baseball games this week!) You can buy the bundle now for $98.99 and save - it's more if you buy everything separately. To purchase or read more about this curriculum, please go HERE.